As a local independent manufacturer, we can produce custom pieces with lead time and volume which many of our dealers have been taking advantage of. Below are just some of these solutions from recent projects. The Waterfall-Jury Chair is a modified Waterfall featuring a column base with footring and is bolted on site. As many of these were used in a touchdown university setting, it also features a return mechanism to ensure uniformity throughout the facility when not in use. To accommodate various touchdown desking styles at a university project, custom Jose Highbacks included integrated power and USB outlets. This work-in-progress veneer reception table was designed and built for an engineering firm’s office as a statement piece. In this design study, we explore the many forms of our private work pods. The idea was first standardised into our Focus Pod and has gradually evolved into many iterations to suit a variety of applications. 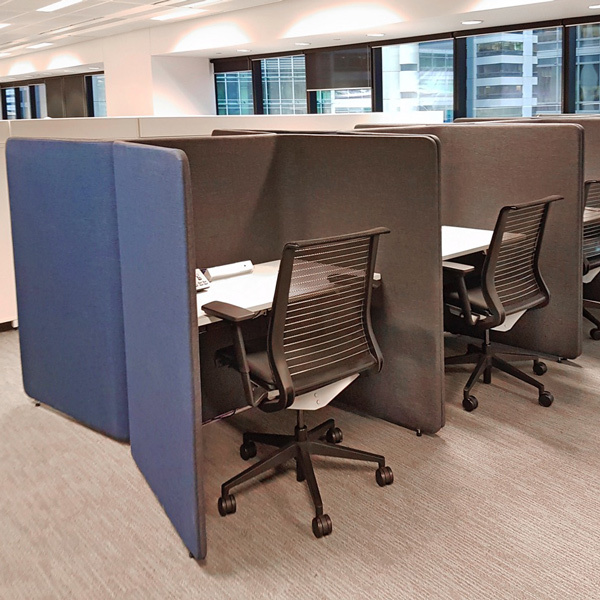 Like with all our screen and worktop products, each desking pod is customised on a per project basis and we’ve used a multitude of finishes from board and fabric to more challenging materials such as PET board. The Focus Pod’s strength lies in its simplicity with carefully considered angles acting as stabilisers. Experimenting with one of our favourite screen materials, a PET board version was created with subtle reinforcement bars added to combat the softness of the screen. 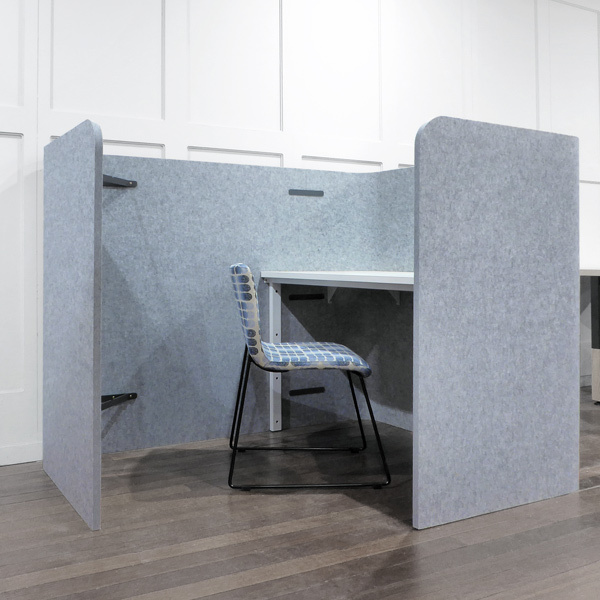 Mallard Booth takes the concept a step further and creates a private working space. The lower corner shelf can be used for keeping personal effects and the top hanging rail for coat/jackets. Spring has sprung. Now is the perfect time of year to do a full office evaluation, de-clutter and refresh. Sound a bit daunting? It’s not. If you’re looking to liven up your workspace with the change of season, there are simple things you can do to create a warm, inviting space that inspires your employees and impresses your visitors without blowing through your design budget. Ahead-of-the-curve workspaces go beyond being ‘functional’ and ‘clean’, they also capture the spirit of the company and its brand. By keeping the bare bones of the design space neutral in colour, you make room for swapping in seasonal quirky touches without looking excessive. The good news is, your seasonal changes don’t need to be significant, or expensive. A feature wall with your company logo is one place to start, or mix in some vintage touches, kitschy knick knack’s, something handmade or easily swapped accessories like throw pillows or planting pots (you do have plant life in your workspace right? Because that is the ultimate way to ‘spring your workplace’ to life!). Search online and download unique photos or images that create conversation and speak to your brand (or course by acquiring the appropriate licensing). Make the images your own by cropping, zooming, or adding custom effects. Once the images are matted and framed, they become fresh, unexpected and unique art installations that don’t break the bank. Blowing up two to three pieces will create an ambiance that livens up your workspace. By holding onto the frames, you can swap images and photos in and out according to seasonality – keeping your workplace crisp and on trend. Remember when fluro and neon were all the rage in design? If so, you probably also remember cringing at the thought a decade later. Instead of putting a heavy investment in design solutions that are incredibly fashionable in the moment, but might come with a short lifecycle, consider integrating materials that will carry you through not only multiple seasons – but multiple years. Materials like timber and laminate for instance create comfortable environments without threatening to come back and haunt your organization’s photo records years down the road. When it comes to giving your workspace a spring refresh, it’s all about putting the right pieces, in the right places to create an environment that employees, executives and clients enjoy spending time in. A lively space awakens innovation and productivity, allowing your business to grow right along with the season. It’s no surprise really. As baby boomers reach retirement and millennials begin stepping into executive positions, they’re taking on the kinds of responsibilities that require in-depth, strategic thinking. Having a quiet workspace allows them to tune out chatter, which in turn increases productivity and overall morale throughout the workplace. Architects, designers and project managers trying to develop meaningful workspaces to cater a wide range of work styles might want to focus less on ping pong tables and brag worthy breakrooms, and more on creating personal offices or quiet spaces which allow team members to work their best. For this reason, the future office must really embrace the dynamic, fluid nature of work in today’s business landscape. By creating an agile workplace where employees are flexible in choosing the best type of space for the work at hand, you are making room for them to move seamlessly through individual and group work – fully supporting work flow from a 360 degree perspective. In today’s business landscape, environmentally designed workspaces are quickly becoming the norm as younger generations step into more managerial roles and begin to transform the business environment to align with their personal ideologies. And what’s often a top priority for our next generation of executives? You’ve got it – green initiatives. The Australian Government has implemented a Programme for the Endorsement of Forest Certification (PEFC), Forest Stewardship Council (FSC) and Australian Forest Standard (AFS) to ensure true sustainable forest management practices to protect the 400,000 hectares of Australian forests. When considering wood based furniture like desking or common room tables, opting for FSC or AFS certified products ensures you are sourcing your design solutions from a sustainably managed forest. Now that’s a breath of fresh air! What are VOCs? Good question! Volatile organic compounds (VOCs) are a family of harmful which can be released into indoor air from a number of sources, including workplace furniture (flame retardants and formaldehyde being quite common). While some VOCs are more toxic than others, the health risks associated will depend on the levels you are exposed to, the length of time you are exposed, and your individual sensitivity to toxicity. 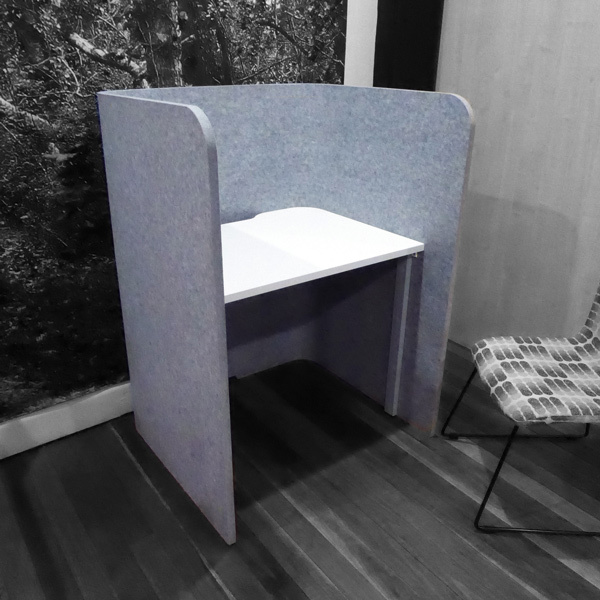 Considering the fact that the workplace has become a second home to employees and executive’s alike, introducing low VOC furniture into your workspace will be an instrumental step towards driving a greener and healthier work environment. The Martindale test is a measure of the durability of a fabric. The tests are undertaken on upholstery fabrics to check their suitability for various uses – whether this be to ensure longevity for your home or small-business or commercial furniture solutions. The test is also known as the ‘rub test’ and essentially tests for abrasion resistance. Depending on your design needs, a high Martindale count can go a long way in reducing your environmental impact and getting the most out of your budget. Whether you are own and operate a small business, or manage a major enterprise operation – supporting green initiatives is easier than you think. All it takes is a little information, and a firm commitment to growing a healthier planet, by building a sustainable workplace. Sustainability in the workplace has gone far beyond being a ‘trend’, or a way to differentiate your business and build your brand – it’s become the norm. As millennials are moving into executive positions, and generation begins to enter the workforce, more and more high-quality employees are looking to work with and build organizations which are aligned with their personal ideologies. And to say that environmentally consciousness is top of mind for the next generations, is an understatement. As your business continues to grow, and you seek out architecture, design and furniture solutions that speak to the direction in which you are moving, consider these four R’s as excellent routes for giving your sustainability efforts a refresh. Traditional Recycling: If you’re looking to completely remove pieces from your office in efforts of updating your office stylistically or ergonomically (or both for that matter), you can dismantle pieces into their constituent parts (such as plastic, wood, metal, etc) and recycle them appropriately. Repair: Breathe new life into tired furniture and fittings with new fabrics, textiles and paint. What was once an outdated workplace furniture solution can quickly become a trendy, one-of-a-kind statement piece that shows employees, clients and/or customers you are up to speed with current design trends! Polishers up can executive furniture to return it to its original brilliance, reupholster pieces in new fabrics, and opt for carpet and/or leather cleaning to remove stubborn stains that may be dating (and devaluing) your brand. Resale: Do some research into whether there is a market for your second-hand furniture. If so, arrange for its resale to help recoup some of the cost – funds which can be put back into updating your workplace with new furniture solutions that better reflect the direction your business is moving in. Reuse: Consider matching your old office furniture with need among charities. Many not-for-profit agencies and organizations could benefit from receiving furniture solutions that aren’t at the top of their priority list in terms of investment. In helping to drive charitable work forward – you become an organization that helps communities thrive. This goes far beyond being a ‘feel good’ measure as it establishes your brand as being community driven and socially responsible. Oh – and don’t forget about IT. Recycling IT: If your devices and IT equipment that have come to the end of their business lifecycle, and you are in need of an upgrade in order to ensure your technological capabilities are ahead of the curve in your industry, they can often be recycled. If you wipe your data and hard drives in order to protect your confidentiality, products can often be donated to charitable organizations, who will in turn pass them on to grateful end users. If your IT products or devices. Workplace design is one of the most influential tools which can be used to help achieve business goals. The power of space to influence our energy, interaction, health, and drive is tremendous. Not surprisingly, when we discuss the workplace of the future – sustainable design tools, products and services are quickly identified innovative solutions to help organize and implement a new way of working – with increasingly positive results to an organization’s bottom line. How exactly do environmentally conscious choices affect your business? We’re glad you asked! Now that employees (and executives alike) are logging more hours at the office than ever before, they have become more immediately linked to the company they work for. For this reason, employees are more likely to enjoy more job satisfaction when they are working with an organization aligned to their own personal belief systems. Workplace sustainability instills a pride in the workforce and demonstrates an organization’s commitment to “walk the walk”. Sustainable workplaces help to improve productivity, reduce operational costs (through energy cost savings), and eliminate waste (using renewable and recyclable materials while also integrating actual recycling programs). Good Environmental Choice Australia (GECA) runs Australia’s only independent, not-for-profit, multi-sector ecolabelling program. The organizations certification program has developed standards by which products and services are independently audited to ensure minimal environmental impact while also taking personal health and wellness, and social ramifications into consideration. By choosing GECA certified products, you are making socially and environmentally sustainable choices for your workplace that make a world of difference. ISO 14001 Environmental Management Systems (EMS) provide an integrated approach to environmental management. Put environmental management at the top of your sustainability goals in order to achieve success while reducing your environmental impact. At the end of the day, sustainable design in the workplace – is just good business. It allows you to reduce costs, increase employee health and grow your business by building a reputation that positions you as a sustainability champion! Choosing the perfect combination of hues for your workplace can be tricky, as the colours should take into account the personality of your organization, while also appealing to the majority of your employees and clients. From an ergonomic standpoint, colour might not seem high on your priority list in ensuring employee comfort. In truth, colour is absolutely crucial in promoting a positive, inspiring work culture. Colours elicit emotional and physical responses from people who are exposed to them for extended periods of time. In general, there are two major colour families: warm and cool. Warm colours include red, orange, yellow and pink and typically appeal to fewer people in a working environment. For instance, vibrant, colours like lime green, fire engine red or fuchsia are described as energetic, power colours — perfect a business thriving on the larger-than-life personalities it employs. Cool colours like blue, green and purple, instill feelings of relaxation and calmness and tend to appeal to a broader base. Cool colours also encourage focus and cause less eye strain, team members to work for longer periods comfortably. The most commonly used colours for workplace environments, are neutral (black, white, grey and brown). While these might not seem like the most exciting choice, they work well in a professional environment because they have the widest appeal. To create a dynamic, engaging and inspiring work environment, integrate a neutral colour scheme that incorporates pops of warm and cool colours through statement furniture, wall art, area rugs and accent walls. While workplace functionality often takes centre stage, as a project manager or interior designer, it’s also important to take colour into consideration whether you are creating a workspace from scratch or giving your business a facelift by integrating new design elements. After all, colour and thoughtfully designed spaces have the power to inspire creative, innovative ideas that drive growth and position your business for prosperity and success. Talki is a table leg system designed to foster integration and collaboration. The clean and simple design of the Talki system is available in three different variations: Talki is the interactive table for conversation, Walki is a high table to stand around and Wheeli is on castors. Talki comes in a multitude of shapes and sizes. Legs are available in metal with powder coat finish or solid timber. Exclusive to Zenith. For more information, get in touch by email. Lux Studio is the design arm of esteemed Australian manufacturer Luxmy Furniture. The Lux Studio products are smart, flexible and collaborative. They are able to respond to the changes in technology, new ways of working, and new environments. Lux Studio designs and manufacturing processes are agile, lean and adaptable. All products are fully customisable and can be made in a short lead time. As workplace design becomes more sophisticated and inclusive, architects, designers and project managers alike are continuing to learn more about the science behind ergonomic seating. The true objective of an ergonomic seating is to provide not only the proper function, but to ensure all important aspects surrounding user comfort and is not just limited to work chairs but applies to other office chairs and lounges. People who are more comfortable in their seats, are more likely to be able to contribute to workplace productivity for longer durations. Seating that fails to provide effective support and adjustability can significantly increase spinal stresses, resulting in discomfort, increased risk for injury – which can in turn cause a spike in sick days and impact the overall bottom line of an organization. How important is cushioning? Very. For instance, contrary to popular belief, a thicker seat cushion does not necessarily equal comfort. While thicker foam may feel softer at first, it could lead to discomfort after extended use. Foam quality and density for instance, should actually be considered critical factors when designing ergonomic seating. Manufacturers of ergonomic seating solutions, will determine the appropriate foam density by using an IFD (initial force deflection) measurement. Proper IFD varies based on the type of foam used, thickness and contouring. In short, long-term comfort is accomplished through the quality and density of the cushioning in your workplace seating. For project managers and / or interior designers looking to create a truly ergonomic workplace, it’s also crucial to consider the actual design of the seating solutions you are considering for integration. The contours, depth and height of both the seat and back must support the user while at the same time encouraging proper movement. As explored in Universal Design, the best seating can cater for a broad range of user sizes, preferences and needs. Taking these factors into consideration, should have everyone in your organization – sitting quite comfortably!